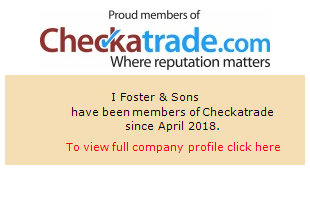 The personal data that you provide will be used by I.Foster & Sons LTD to provide you with the quotation that you have requested. In addition to the above should you choose to proceed with our quotation you are consenting to your personal data being shared with third parties such as Fensa and any insurance backed guarantee providers for the purposes of fulfilling the requirements of the Competent Persons Scheme for self certification under The Building Regulations. This data will be used to provide essential documentation and will be retained on file so that we can honour your guarantee and provide ongoing maintenance advice and or assistance beyond your guarantee period or until you inform us that you no longer require us to keep your personal data. Should you provide us with any financial details for the purpose of settling an outstanding invoice this information will be destroyed once payment has been successful.